Produce Meat Dishes: Roasted Pork Belly, Pork Loin Cutlet & Pork Crepinette. 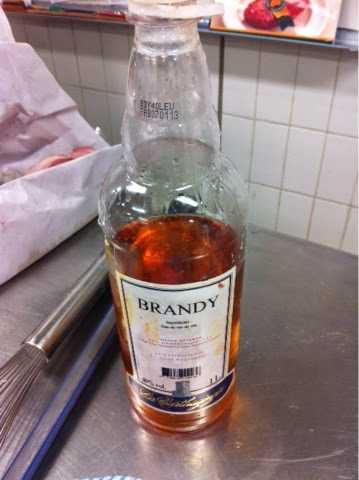 So last Tuesday, we worked on boning pork. For those who don't like pork, you can always turn away from looking at the screen. We had a couple of Muslims in the class. 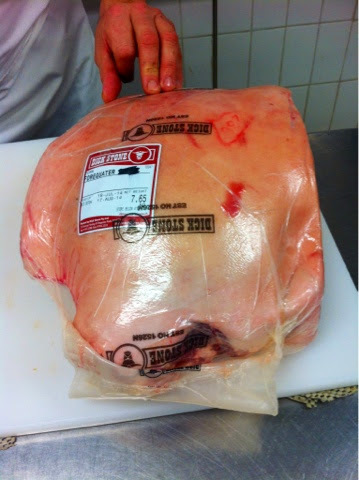 How they got around the issue of touching pork was using the blue coloured gloves when handling pork. The forequarter is the back half of the animal, with the back hind legs. Generally, the name of the parts are common across all the livestock animals. Now, in the picture, this is the forequarter with the plastic vacuum wrap torn off. The meat off the areas of the forequarter are more used for braising, and stewing as it is the muscle area and more tougher meat. 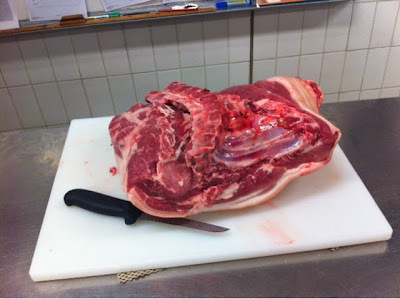 The boning knife is used for separating the muscles and boning the meat, as per its function. 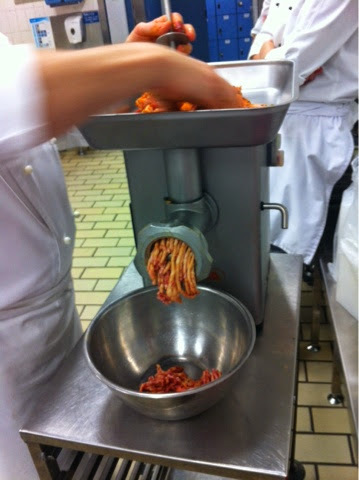 To make the meat into mince, one can use either the mincer machine which makes the work a lot easier. The other way would be to use the Robocoupe or Processor to mince up the meat. The cooking brandy is added as the meat is minced up to add that flavour. Just like how one makes sausages, the mince meat is then enclosed in the stomach lining or caul fat of the intestines of either a cow, pig or sheep. This stomach lining, as Chef Roux explains, is stretched using a machine and very elastic to produce that translucent lace of fat. 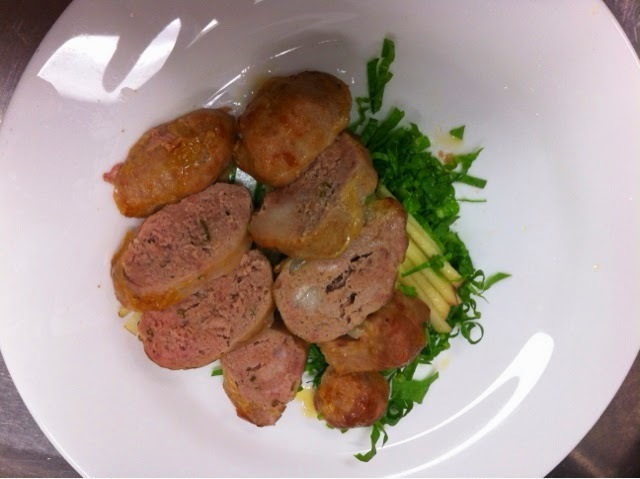 The outcome of mince wrapped in this caul fat is called crepinette. 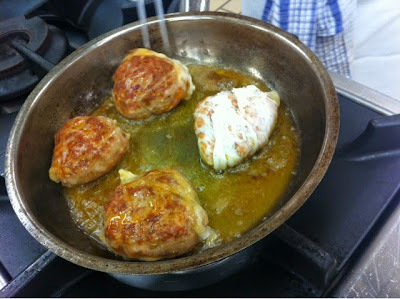 The caul fat melts as it cooks, and provides flavour and moisture to the end product. Frying pork crepinettes. The white bit is the unmelted caul fat. The Roasted Pork Belly was among the favourite of Chef Roux. 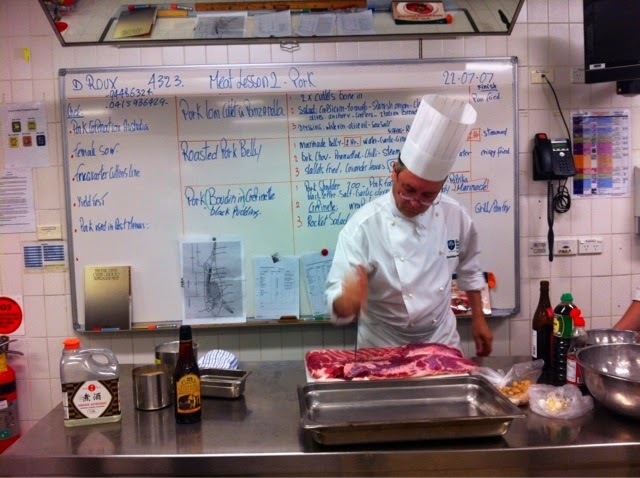 I am not sure how I'd make it for exam as it was mostly prepared by the chef. The entire slab of pork belly (not pictured here) was placed in a baking container, and braised in water in a combi steam oven for about 90 minutes. Cant remember what the cooking temperature was. 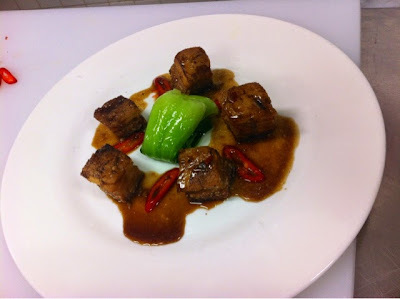 The sauce taken from the braising was then removed and then reduced, and palm sugar was added to give it that caramelized flavour. 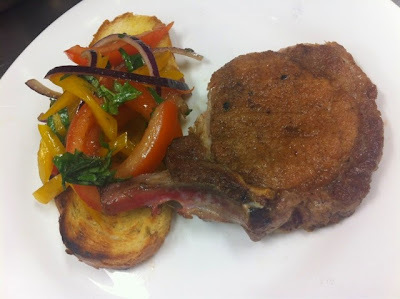 Pork Cutlet & Panzanella and salad. The pork cutlet was just basically grilled, and its sides sealed. The bread was brushed with olive oil on both sides and then browned in a salamander, and a vinaigrette dressing made for the salad.